Back from the Trenches, Waddesden and Singing at the Synagogue! Me in a WW1 Trench at Swarbridgeworth! 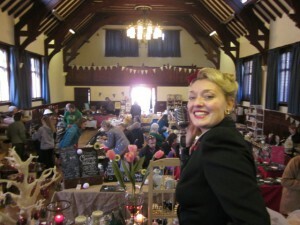 Me singing at Waddesden Village Hall! Paul Singing Sinatra at Shabbytque! Today I have been out and about singing in Harrow performing my “Great American Song Book” show at the Middlesex New Synagogue in Bessborough Road. I first performed there a year last July and I have since become a regular visiter to the Synagogue performing a verity of different shows. Todays show “The Great American Song Book” is one of my favourites as it includes music from some of the best-loved writers of the 20th century, Rodgers and Hammerstein, Irving Berlin, Cole Porter – so you could say all my favourites! I’ve also been busy this weekend too. 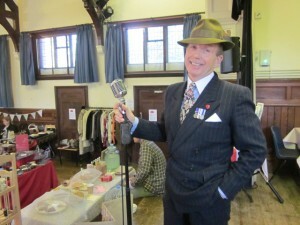 On Saturday I was booked to perform in Sawbridgeworth at the Memorial Hall for the towns WW1 event. 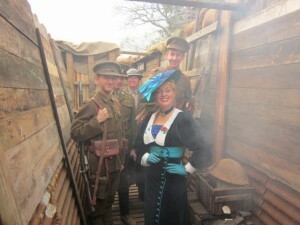 I was engaged to perform my WW1 show “Pack Up Your Troubles” and afterwards I was invited into the trenches. Friends of the Memorial Hall had especial built a trench as an attraction and with all the re-enacters inside it looked very realistic indeed. I expect a few of you have already seen my photos on Facebook! Sunday was remembrance and Paul and I were singing at Waddesden Village Hall for Shabbytque Fairs. At 11 am we held a minute’s silence and far off in the distance we could hear a lone bugler playing the last post which was all very moving. After the minutes silence I sang “Requiem to a solder” and then 20 minutes on, 20 minutes off all through the day which seem to go down very well. Paul sang too, and proved to be a real hit with the ladies! I’m next singing for Shabbytquue on the 30th November when the fair moves to Waltham St Laurance and as you might imagine I’m looking forward to that very much. Tomorrow I have an early 11am show to mak remembrance in Burnham and then on Friday I’m off down to Hastings for the launching of a lifeboat memorial, – but more on that later. In the meantime I must get to bed. Thank-you for following and Toodle Pip!